In the News | Fallgatter Catlin & Varon, P.A. 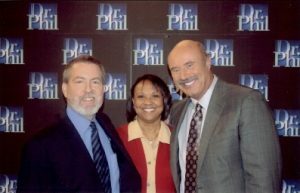 Curtis Fallgatter was selected by Dr. Phil to assist “The Dr. Phil Family” – a local family Dr. Phil followed for several years – with criminal and family law issues. Curtis appeared on three episodes of Dr. Phil, which aired November 23 and 30, 2009, and January 25, 2010. We are proud that such a nationally recognized psychologist, who strives to help out families, chose our firm to assist in such important matters. On numerous occasions, Jacksonville local news broadcasts, WJXT Channel 4 and First Coast News, have called on Curtis Fallgatter to provide legal analysis on both criminal prosecution and criminal defense issues. Due to his extensive experience as a local Jacksonville, FL criminal attorney and his federal experience as a former Assistant US Attorney, Mr. Fallgatter and the team at Fallgatter Catlin & Varon, P.A. are often seen on Jacksonville's local news broadcasts.